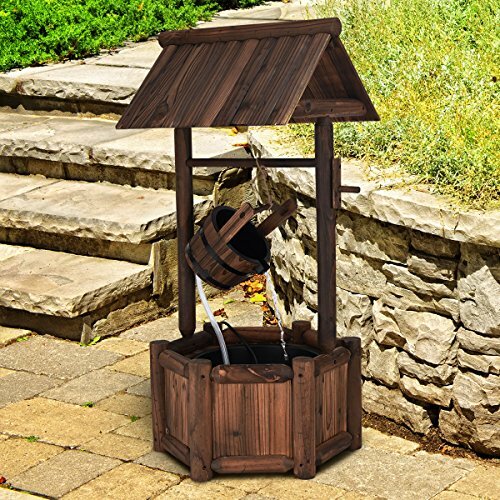 Giantex Wishing Well Water Fountain Rustic Wooden Outdoor Garden Decorative Fountain Backyard w/Electric Pump | Fountain City Art Ctr. This our brand new wishing well fountain, is an ideal addition to your backyard, patio or garden. The solid fir wood construction with an attractive burnt finish is built to withstand the weather, and includes corrosion-resistant stainless steel hardware. This round wishing well bucket with plastic liner acts as the outlet for pumped water to be released in fountain style. With UL certified 120V electric pump with a 300 liter-per-hour flow rate brings water back up from the wishing well tank to keep the water flowing. You can control the flow rate by a black knob. Simply plug it in and fill with water, it will work as you desired. Don't hesitate to buy it now ! 【UL Certified 120V Electric Pump】: UL certified 120V electric pump serves as a powerful engine and a 300 liter-per-hour flow rate brings water back up from the wishing well tank to keep the persistent water flowing. Both of them ensure a steady water flow. 【A Beautiful Outdoor Ornament】: This wishing well water fountain perfectly serves as a garden ornament or an outdoor sculpture in your backyard, patio or garden. Its burnish color and wishing well frame highlights rustic style and exquisite craftsmanship. 【Weather-Resistant & Durable Construction】: The water fountain frame is constructed of solid fir wood with fine burnt finish so that it can withstand weather and resist corrosion. All parts are assembled with high-quality hardware to ensure its stability. 【Easy Assembly】: All detailed parts are given a number and specific assembling steps are clearly listed in the instruction. It will take you short time to assemble this wishing well water fountain well. 【Plastic Outlet & Convenient Flow Rate Control】: The outlet for running water of this round wishing well bucket creates a fountain effect. The black knob is designed for controlling the flow rate and equipped with 4 suckers for better fixing.